Utagawa Kunisada/Toyokuni III (1786-1865) Yugiri and Izaemon in the Kabuki Play Kuruwa Bunsho, 1858. Oban. 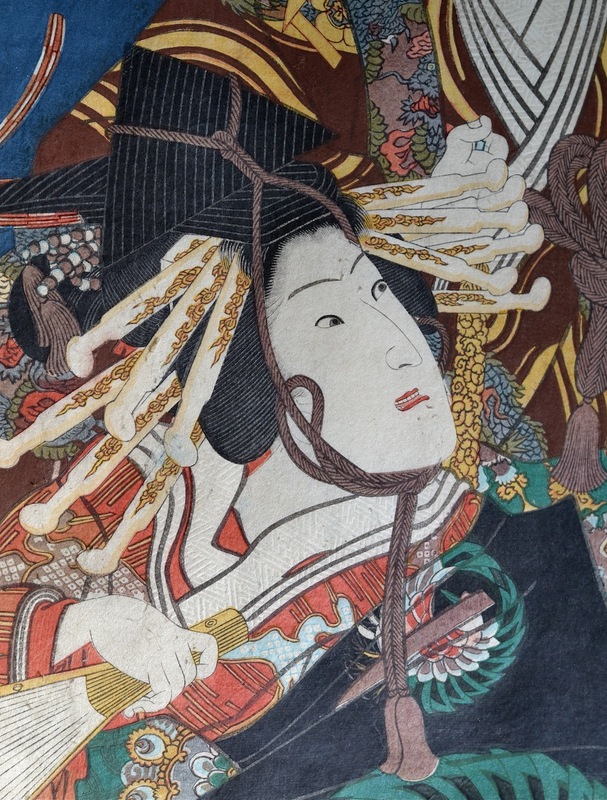 Another outstanding example of the sophistication and quality of the late prints of Kunisada. The richness and complexity of the garments here overwhelm the composition and create a vital energy at the heart of the picture around which the portraits of the actors remain static and lost in contemplation. The onnagata role of the courtesan Yugiri is played by Onoe Kikugoro IV; and her lover, Fujiya Izaemon is played by Kataoka Nizaemon VIII. 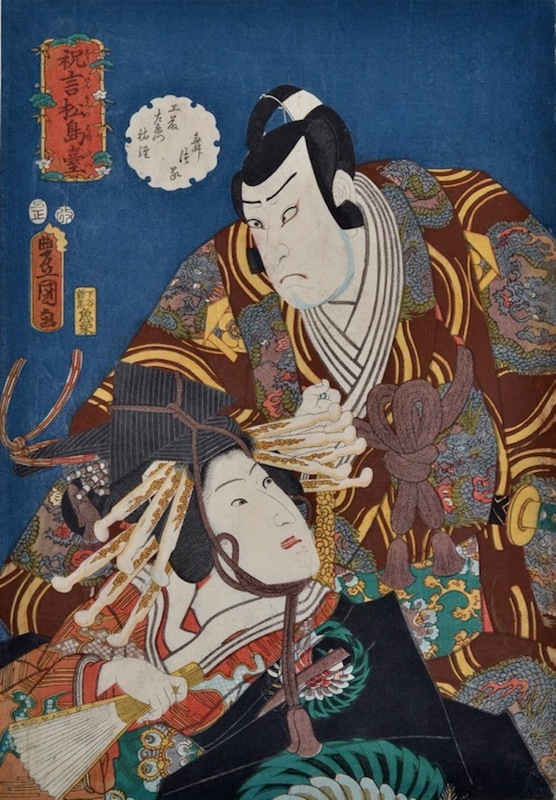 The play would have been a familiar theme to kabuki audiences - Izaemon is well bred and falls for the most glamorous of the Osaka courtesans, Yugiri; identifiable by her expensive and gaudy outfit and the many wooden hair pins that she wears. Izaemon is disinherited as a result and becomes angry and jealous of her other clients. They are reconciled and his family relent and he is able to redeem Yugiri and marry her. His status is reinstated and they live happily ever after. This is a fine print and a fine character study. The impression and colour are exceptional and with the exception of some slight rubbing to the face the condition is also very fine.